Why Should You Invest in LED Grow Lights? The point of grow lights is to replace the natural sunlight that plants would receive outdoors. Plants must have light to flourish, but for the processes of photosynthesis that combine CO2 and water to create sugars and oxygen, not all wavelengths of sunlight are created equally. The highest rate of photosynthesis is provided primarily by orange and red lights and secondarily by blue-violet light. The majority of green spectrum is reflected, which gives plants their pleasing green color. Fortunately, the best LED grow lights can fine-tune their spectrum emission to optimize for any plant you want to grow at its current stage of growth. LEDs are the most efficient method of converting electricity to light in the human visible spectrum. Applied to grow lights, they also save energy by reducing wasteful spectrum emission not required for plant metabolism. Later in this guide, you will find LED grow light reviews that discuss spectrum profiles. Unlike indoor grow lights such as metal halide grow lights that rely on one or a few output bulbs, LED lighting uses dozens of lamps. If a few LEDs fail or dim in a large array, little light is lost as a result. Quality LEDs have a far greater average lifespan than other lights and fade little over that lifespan. The normal lifespan of an LED exceeds 50,000 hours as compared to a metal halide light that loses 50 percent of its brightness well before 10,000 hours of operation. As LEDs near their end of life, they are still producing 70% light output. All lighting technologies produce waste heat. For lamps other than LEDs, this heat is directed at the plants. This excess heat may have adverse effects if not channeled away. The minimal heat from LEDs is directed in the opposite direction of the light they emit and heat sinks easily wick it away. LED lighting, also known as solid-state lighting, requires no vacuum tubes, special gases or a filament to produce light. Different base materials primed with special impurities can be used to customize the wavelengths of light an LED produces. These impurities include tellurium, germanium, silicon, zinc and nitrogen among others. You may have heard of “Moore’s Law” regarding the doubling of transistors on a CPU chip every 18 to 24 months. For LEDs, there is an analogous law known as Haitz’s Law. It states that the cost per unit of useful light is reduced 90% and the light produced by an LED increases 20-fold for each decade. This is why LEDs continue to increase in efficiency and their purchase costs continue to decline. According to the International Energy Agency, lighting consumes nearly 20 percent of total electricity demand around the globe. This amount is equal to 70 percent of the CO2 produced by all the world’s cars. Most of this light is produced by inefficient incandescent bulbs and non-LED lighting technologies. Unlike HID or fluorescent lights, LEDs do not contain mercury. Included in High-Intensity Discharge lighting are Metal Halide and High-Pressure Sodium lights. Both are similar with regard to spectrum output, heat and maintenance costs, so they can be discussed together. Regardless if MH or HPS lamps are used, compared to LED lighting they have a number of deficiencies. They are hot, so need higher placement. They require reflectors, a ballast, a hood and heat venting. These latter items are often overlooked in LED grow light reviews. Both MH and HPS produce an adequate growing spectrum and spectrum not required for growing, which energy is lost. Fluorescent lighting has recently improved due to T5 High Output bulbs. These are significantly more energy efficient and cooler than the standard T8 bulb. A T5 contains a mixture of mercury vapor along with an inert gas such as neon, argon or krypton. There are two different spectrum intensities, warm or cool white. The induction lamp was invented by Nikolai Tesla in 1891 and it is still one of the most reliable and energy efficient sources of light. They have fewer parts to fail, run cool and produce a broad light spectrum. They are sometimes referred to as plasma lights. 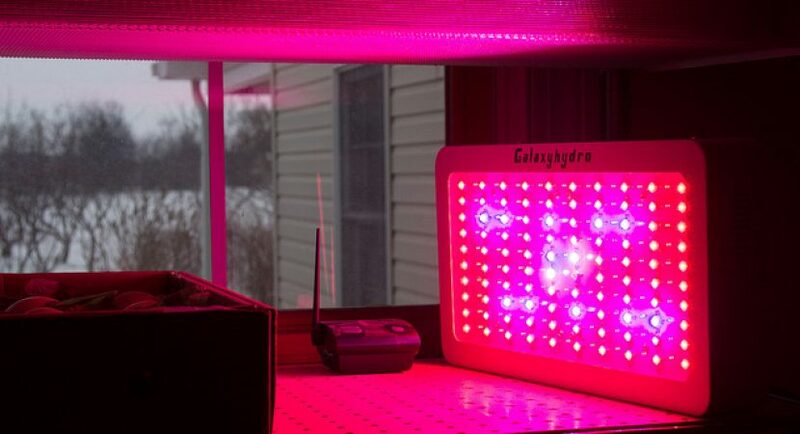 According to Let’s Tend The Garden, The LED grow lights have already overtaken other lighting technologies and improvements are coming fast, so you could say that the future of grow light technology is already here. Other technologies, such as fluorescent and induction lighting make incremental improvements, but they cannot keep up with LEDs.